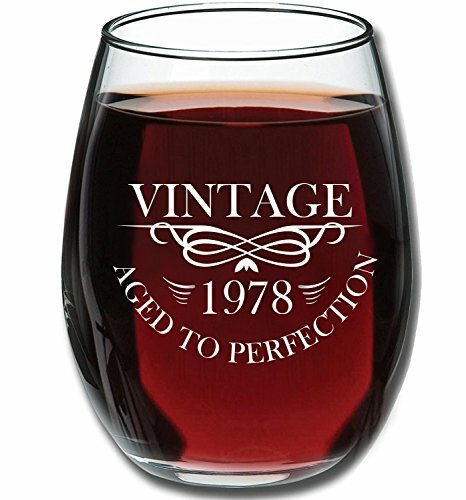 MAKES A MEMORABLE GIFT: This 1978 milestone Birthday or Anniversary Wine Glass is the perfect 40th birthday gift for women and men. It reads Aged to Perfection 1978 in vibrant white ink and is truly a permanent imprint that will never fade or lose its glow. CLASSY ERGONOMIC DESIGN: This versatile and elegant 15 oz. stemless wine glass offers excellent clarity for showcasing a variety of beverages! Use it to serve red or white wine, cocktails, or juice. Not only does its ergonomic shape create a sleek silhouette, it fits effortlessly in your hand. CLASS REUNION AND PARTIES: The 1978 milestone glasses are the perfect party favors for 1978 class reunions and 40th Birthday or Anniversary parties. Don't make the mistake and buy gifts that have 40th printed on them, only to be outdated the next year.